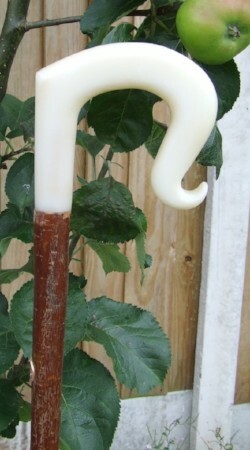 HDPE crook on a hazel shank. 52 incjes tall. Finished with a solid brass ferrule. Great first crook for a junior. HDPE is used in industry for all sorts of applications and is almost indistructable. We decided to try this as a new material to make cheaper every day crooks and it seems to work very well.